This laundry trolley comes with 3 removable large canvas bags which is an ideal solution to organized your washing loads. The calio bags are hanged with rubberized hooks and supported at the bottom by a wire shelf. Each bag can be individually and easily carried by the use of the hook handle. Even the largest loads of washing can be sorted easily. The heavy duty metal structure will ensure use over years. Nova Star are storage specialists, providing space-saving products for the home and office. Nova Star products are famous for their solid structure, unique design, modern style, versatility and easy assembly. Nova Star strives to provide creative solutions that will optimize the un-used spaces of small areas such as the bathroom, toilet, and laundry. With Nova Star products in your home or office you’ll find new room and create the ultimate organised space. 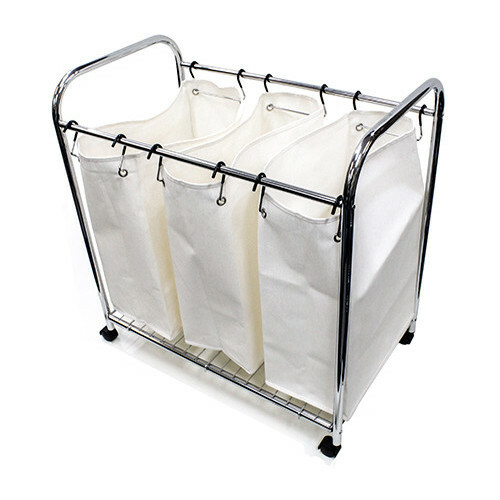 When you buy a 3 Divider Laundry Trolley Large online from Temple & Webster in Australia, we make it as easy as possible for you to find out when your product will be delivered to your home in Melbourne, Sydney or any major city. You can check on a delivery estimate for the Nova Star Part #: BN06 here. If you have any questions about your purchase or any other Laundry Baskets & Organisation product for sale our customer service representatives are available to help.Whether you just want to buy a 3 Divider Laundry Trolley Large or shop for your entire home, Temple & Webster has a zillion things home. This was exactly what my daughter needed, it is exactly as pictured, easy to put together, i"m 70 years old and had no problems at all, arrived promptly couldn't be happier.